Poplars Caravan and Chalet Park is set in an idyllic rural location on the edge of the fishing village of East Runton, yet just a few minutes stroll from the beach. Could not be better placed for exploring the beauty of North Norfolk. 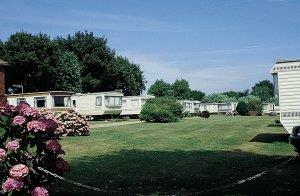 Poplars has been sensitively landscaped with ornamental trees and shrubs and acres of carefully tended grass. The chalet holiday homes are spaciously sited giving visitors a chance to relax in privacy. All chalets non-smoking and sorry no pets. Open March to November. From Cromer follow Coast Road A149 towards Sheringham. In the village of East Runton, turn left into Felbrigg Road. Follow through village, turn right at duck pond then right again into Brick Lane.